Maybe I was wrong, perhaps not all is lost at CPC17. Whilst yesterday the leadership threatening fallout was doing its worst to dampen our spirits, today was more united and looked to the future rather than dwelling on the past. 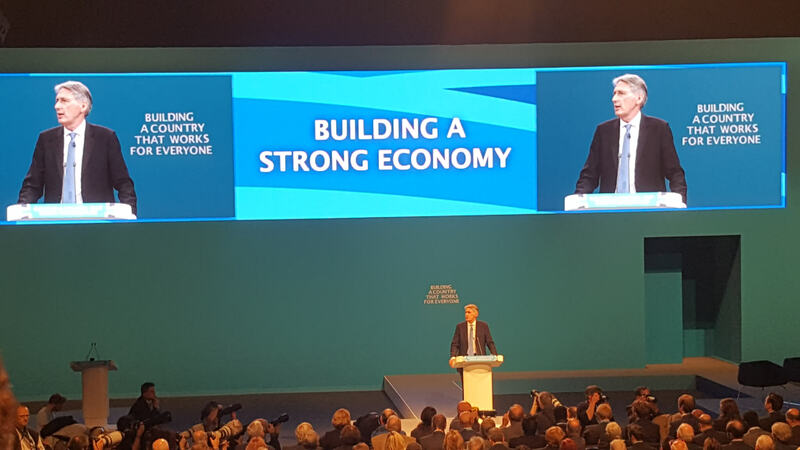 Day two at CPC17 has been rightly focused on how to build and maintain a strong economy for the United Kingdom. This morning’s main attraction was obviously the Chancellor’s speech in which, despite his soft Brexit stance shining through, he committed the Conservative Party to an economic policy profile that works for everyone; not just the many, not just the few – everyone. Delegates were also treated to some contributions from ordinary party members – a move to appease those who believe that Conservative Campaign Head Quarters (CCHQ) is ignoring the grassroots of the party. And yes, the elephant in the room, the General Election was acknowledged, the Chancellor offering a half-hearted, forced apology to make it look like he cares. But the members are clearly more forgiving today – and the party feels more united and looking to the future rather than looking back in anger. In addition, the tolerant left showed their true colours again this afternoon when a Brexit discussion meeting for conference delegates and other supporters was stormed by anti-Brexit, and anti-Jacob Rees-Mogg, protesters. These enemies of democracy were put down by Rees-Mogg in an informal, impromptu, debate which followed. Mr Rees-Mogg said, “I don’t mind who stays in this hall or whether they agree with me or not” and that “we may disagree on things, but just because you disagree with somebody, that doesn’t make them a bad person. The two are separate.” After minutes of one-sided debate, Mr Rees-Mogg said, “Well, very nice to have met you” as the anti-democrat was escorted out of the building. Mr Rees-Mogg is due to speak again this afternoon at a “Leave means Leave” event – perhaps the tolerant left will have some respect for delegates this time around! Today, CPC has been an improvement on the depressing doom-and-gloom, scenario that delegates witnessed yesterday and it is now clear that, despite CCHQ’s neglect of ordinary party members, the party is ready to move on and look to the future and look to making a Brexit that works for everyone. Tomorrow, we can look forward to hearing from our Health Secretary, Jeremy Hunt, and our International Trade Secretary, Liam Fox, amongst others. Keep watching. A Conservative member living in North Somerset - pro Brexit. Cheery chap wanting to make his mark in the world of politics with a particular interest in health and defence.